Our most popular dock style, a great choice for almost any waterfront. The FWM Stationary Dock is a great choice for almost any waterfront, especially depths of 10 feet or less. Known for its outstanding stability, it features aluminum legs and pole pads and stainless-steel hardware. Each heavy-walled pole has two pre-drilled holes on the bottom allowing the leg pad to be placed flush to the bottom (for rocky/solid environments) or a secondary position that allows the dock leg to pass through the leg pad and penetrate the ground, providing a more secure anchoring stance for your dock. Put the drill away. FWM frames come with a track system on the side and bottom of the frame making the mounting of accessories a snap. Need to move a cleat or aluminum ladder from one position to another? No problem, loosen the screw, slide and re-tighten. It’s that easy. 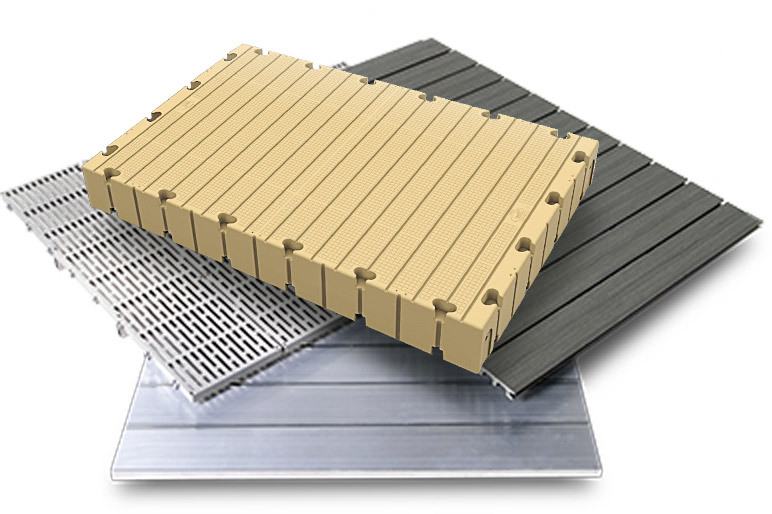 Decking Panel – Each dock section comes with the decking installed in pre-panelized decking pieces (two or four). This allows you to dramatically reduce the weight of your dock by almost 50% in a matter of minutes making seasonal installation and removal a breeze. Something for everyone! Our Pole Driven docks are available with three different decking options in two different colors (ThruFlow Gray, ThruFlow Brown, EON Gray, EON Brown, Natural Aluminum). Each product has been meticulously selected by the FWM team and has been tested and proven over time. Say goodbye to splinter, straining, mold, rust, excessive weight...the list goes on and on. 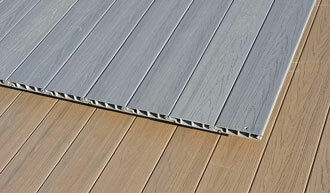 FWM only offers top quality decking surfaces. Some ask why we don't offer cedar or low-cost composites. The answer, " In 15 years we want your dock to look as good as it did the first day you bought it." Maintenance free and zero cost of ownership is the new name of the game. Easily connect two dock sections with a standard or 90-degree splice kit. The all aluminum and stainless steel construction will give you the security you need even during inclement weather. If this doesn't make building your dock easy enough, in the winter, the dock breaks down into sections using just one allen key. Now you have any easy portable dock or port a dock. FWM frames are available in three sizes (4'x10', 4'x12', 6'x10'). They are designed to be 100% modular and can be put together in an endless number of layouts and configurations. Your dock layout is restricted only by your imagination. You can even change the style of your dock from your initial purchase into any of our three styles (pole driven, rolling, floating). All FWM Dock frames and accessories are maintenance free and use marine-grade aluminum and stainless-steel hardware. The weight-sensitive design makes it a perfect choice for seasonal installation and removal. FWM Docks are designed for people who demand excellence and a lifetime of use from their docks. Unlike some of our competitors, we don’t use galvanized steel or wood. Why? Because it’s simply too heavy and won’t stand up to yearly wear and tear like our 6000 series aluminum. Never again will you have to worry about your dock splintering or rusting. Each heavy walled pole has two pre-drilled holes on the bottom allowing the leg pad to be placed flush to the bottom (for rocky/solid environments) or a secondary position that allows the dock leg to pass through the leg pad and penetrate the ground, providing a more secure anchoring stance for your dock. Each of the three FWM Dock styles (Stationary, Rolling and Floating) have been engineered with an emphasis on stability. Our uniquely engineered cross-bracing technology allows for easy installation with maximum stability, even under stress. Put your drill away! 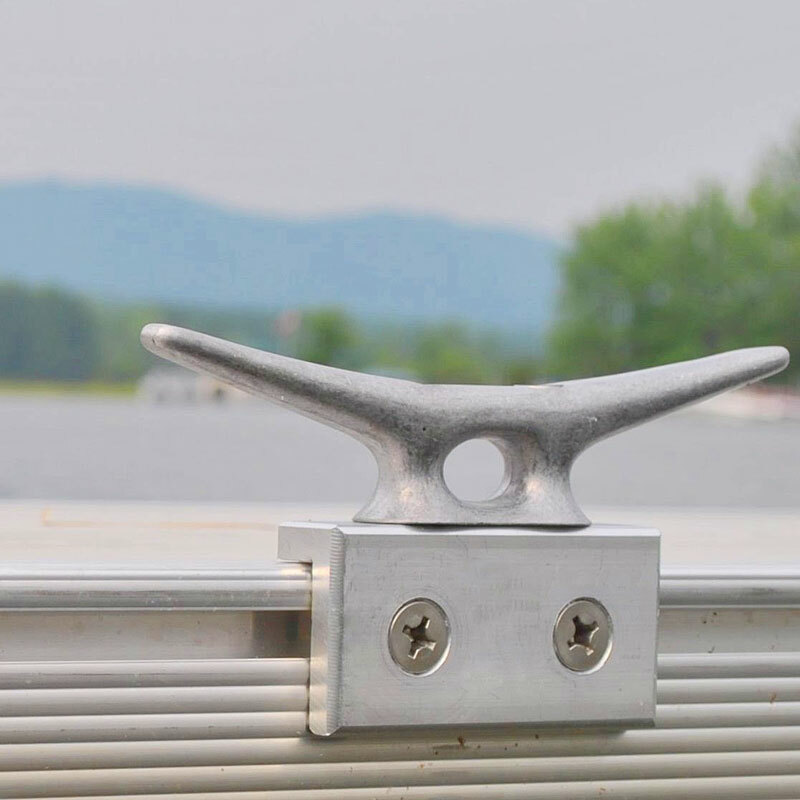 All of our dock parts and accessories are designed to conveniently slide into a retention track that’s available on the sides and bottom of your aluminum dock frame. It’s never been easier to install or move a cleat, ladder or bumper. Our standard splice kits and 90-degree splice kits are used to connect one dock section to another. With these kits you will never need to reach underneath the dock to blindly try and fasten your dock together. We use nylon-coated 316 stainless steel hardware and heavy machined aluminum plates to fasten dock sections together safely and securely. Each of FWM Docks’ frames (4'x8', 4’x10’, 4’x12’, 6’x10’) are designed to be 100% modular. Like a giant adult Lego set, you can assemble your dock in any layout or configuration. You can also easily change the style of your dock from your initial purchase into any of our three styles: stationary, rolling or floating. A unique track system allows you to easily install and adjust the placement of any of our accessories. The sleek, clean and flush look of the FWM Dock aluminum frame has been known to turn the heads of even old-time wooden dock purists. With three decking options and multiple colors, we’re sure to have a decking surface that will appeal to you. You can even add a piece of composite fascia board to the sides of your dock frame, creating the look of a wooden dock while enjoying the maintenance-free qualities of aluminum. Regardless of the decking product you choose, each aluminum dock frame comes with pre-panelized decking that’s easy to install and remove. This makes getting your dock in and out of the water during installation and removal a breeze by drastically reducing the overall weight of each dock section. Aluminum FWM Stationary Docks come in a wide range of standard sizes and are designed to be 100% modular, making it easy for you to configure the exact dock layout you need. At FWM Docks, we spend a tremendous amount of time testing and analyzing decking products. Our select decking options have been tested by the FWM engineers to give you a range of options for the perfect solution on your waterfront. Our decking products come pre-panelized to allow for easy removal and installation. Each decking panel fits right into your dock frame, providing a clean, flush appearance. 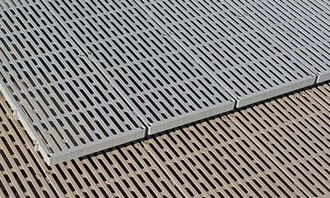 This unique non-slip polymer panel allows water, debris and sunlight to pass through small holes in your walking surface. The 360° non-slip surface not only prevents you and your guests from slips and falls, but also minimizes the damaging effects of waves and wind. Available in cedar or gray. This unique PVC decking product has many unique features that make it a great option for your new dock. One key feature is the I-Beam design that makes this deck board one of the strongest on the market. The I-Beam also creates a channel that runs through the board, creating a cooler walking surface. Available in weathered wood gray and sandstone brown. Our customized, natural aluminum finish decking is designed with a non-slip surface pattern and a heat sync bottom. The unique design draws heat away from the walking surface and down toward the water, keeping your dock comfortably cool even on the hottest summer days. Also available in gray or brown finish. Our aluminum stationary dock systems are designed for a wide range of uses, including residences, parks and recreation, homeowner associations, marinas and more. FWM Docks’ state-of-the-art modular frame design provides an endless number of dock system configurations to meet all of your waterfront needs. Our standard dock products are perfect for small to mid-size marinas. We offer a rugged and proven design that allows you to maximize your slip space while drastically reducing your overall cost of ownership. With financing and leasing options available, there’s never been a better time to find out how you can benefit from an FWM aluminum dock. Wouldn’t it be great to have the best dock on your lake? With so many options available in the residential aluminum dock market it’s easy to get overwhelmed. At FWM we make things simple. We provide our residential customers with low-maintenance docks that are both hassle free and built to our high-quality standards. We offer stationary, rolling and floating aluminum dock systems that are perfect for camps, parks and recreation projects. With our standard dock system, you can easily create cost-effective swimming areas, boat launches, kayak launches, etc. You can even change the dock sections around in a matter of minutes to create a new layout for a special event. Over the years we’ve gained experience creating dock systems especially for homeowners associations. Whether your upcoming waterfront project is large or small we can provide you a maintenance-free docking solution that benefits everyone in your community. We make it easy to create an elevated walkway through wet areas. FWM trail systems have the ability to elevate up to 10 feet above the ground, making access through wet areas a breeze. The FWM trail system uses our traditional dock frame and any of our decking surfaces. Add railings and even hinge kits to accommodate changing elevations. Our modular FWM Docks sections make it easy for you to configure the exact dock layout that works best for your project. Here are the answers to some of the most Frequently Asked Questions about our versatile, durable FWM Dock systems. If you have a question that you don’t see answered here, please contact us. Q: Are FWM Docks saltwater safe? FWM Docks are saltwater safe. Over time, aluminum will naturally oxidize. This actually provides our dock frames with a layer of oxidation protecting them from the saltwater. Q: Can I buy just the FWM frame and install my own decking? This is a question that we get asked a couple of times a year. Unfortunately, the answer is no. FWM Docks must leave our factory with an approved decking product only. This is because we need to ensure that — if our name is on the dock — it’s going to be 100% maintenance free and it will still look great for 10 years and beyond. Q: Does FWM Docks ship nationally? How does the process work? FWM works with multiple shipping companies and brokers to provide you with the lowest possible freight charges. Some customers have access to a loading dock where we can ship everything on one skid. Others require a residential delivery with a two-man lift gate dropoff. Our FWM Docks are located all over the country and we have developed creative, cost-effective ways to make every dropoff seamless for you. Our durable, long-lasting dock systems are designed to provide many, many years of dependable service and enjoyment with minimal maintenance. They are crafted from the highest-quality materials and components, and we proudly stand behind all of our products. Quality product, I tell everyone they can buy from FWM Docks without regrets. Makes my waterfront look amazing compared to when we had an old wooden dock we used to have. We were originally referred to you by a good friend. They had your dock and couldn’t say enough about it. We’ve had our new docks now for several years and seem to add onto it just about every year. We tell everyone that it’s the best investment you could make for life on the water. Our dock looks great and there is absolutely no maintenance required. When I head north in the spring our dock is ready to go. Love our dock and can’t imagine life without it. I’m a lifelong boater as well as an architect. I was impressed by the design of the dock system, the ThruFlow decking and the quality of materials and construction details. I knew I was purchasing a high-quality dock system that would last me for many years. I tell people all the time — make the right decision, it’s an investment. FWM offers a strong, lightweight, environmentally friendly and, best of all, extremely attractive dock.